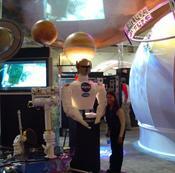 Marlen and Robonaut (and MER) inside NASA's booth. 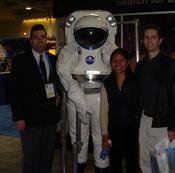 Neil Wittney (a real NASA astronaut), the new prototype spacesuit, Marlen and I. 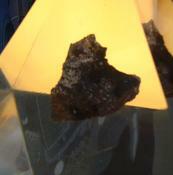 An actual half-fist-sized piece of moon-rock. 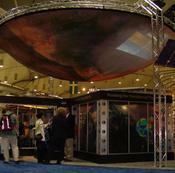 Absolutely stunning NASA booth, the best one there (well hey, it matches their budget). 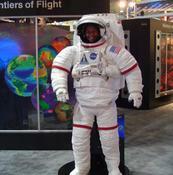 Outside the NASA booth. 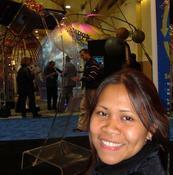 Inside that dome was a brilliant 3D projected and interactive environment, making you feel like you're walking on the moon, mars, etc! 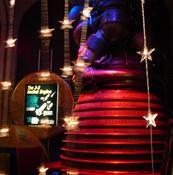 Next stop was the H.R. 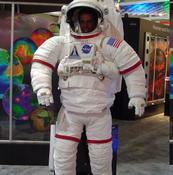 McMillan Space Centre for SpaceFest 04. 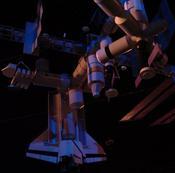 This is a mockup of the finished International Space Station (ISS). 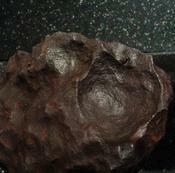 Iron meteorite, about the size of your head (and extremely heavy!). 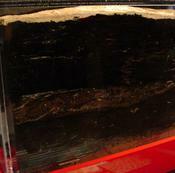 Section of strata containing the KT boundary. Honestly I have no clue where it is, plus the sample's been glazed too I think, not helping much. 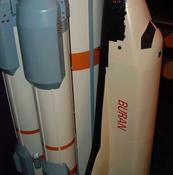 Mockup of the Russian version of the space shuttle, named "Buran" (meaning "snowstorm").